Hampshire Search and Rescue partners with Bag It Up! 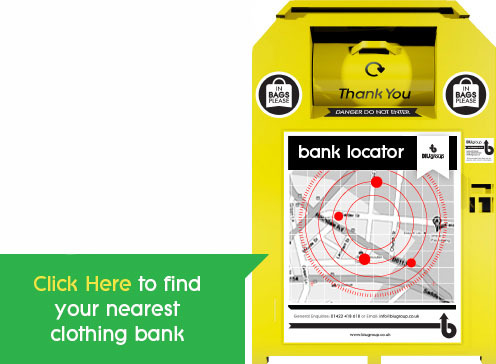 Hampshire Search and Rescue (HANTSAR) are pleased to partner with ‘Bag It Up’ a leading clothing and recycling organisation that helps charities raise funds by collecting and reselling your donation of clothes, shoes and textiles. Our partnership with ‘Bag It Up’ is very important as HANTSAR does not receive any external funding and we have to raise all our own funds to provide our search and rescue services for the people of Hampshire. If you have any unwanted clothing, shoes or textiles, please consider donating them to HANTSAR by putting them in a plastic bag and placing them in one of the HANTSAR recycling banks across Hampshire. Please click on the image below to find your nearest recycling bank. Local Authorities and commercial businesses with a public car park who would be prepared to assist HANTSAR by having a recycling bank on their premises please contact us on BagItUp@hantsar.org and one of our fundraising team will contact you.